From simple sheers and voiles to interlined swags and tails, the choice is almost endless. And if you don’t know the differences in what we are talking about here, don’t panic, we will guide you. At Dressing Rooms we can create pencil pleat tape headings, puff ball, classic hand pleated pinch pleat, goblet pleats, modern wave or eyelets, with or without pelmets or valances. 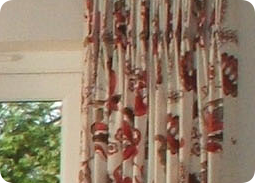 Whatever your heart desires, we’ve made all curtain styles before and know exactly what we are doing.